3 Out Of 2 People...Tee Only $9.99! Ships FREE! You are here: Home / Great Deals / Christmas Deals / 3 Out Of 2 People…Tee Only $9.99! Ships FREE! 3 Out Of 2 People…Tee Only $9.99! Ships FREE! 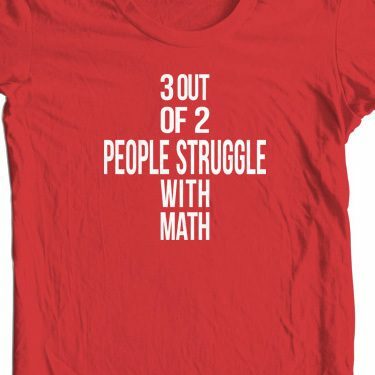 Order the 3 Out Of 2 People Struggle With Math Tee for Only $9.99! Ships FREE! 3 out of 2 people struggle with math but only 4 of them admitted it!